I don’t often make “publicity posts” but I know a lot of people have been waiting for this. Microsoft just released the official Ribbon control for WPF (download link). 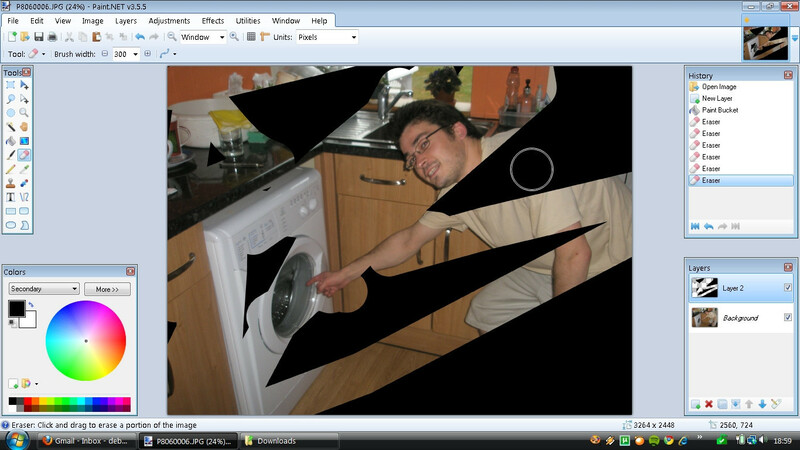 It’s 100% WPF – it isn’t sitting on top of the Windows 7 or MFC Ribbon control, in other words. This is not the same as what was released about 2 years ago in CTP form. This is brand new, released today. Samples and source code are included! Pre-emptive answer: Probably not. Paint.NET is based on WinForms, not WPF, and will likely remain that way. Plus, I have other ideas for what to do with the UI in v4. I’m not convinced the Ribbon is what I want to use. If I did use the Microsoft WPF Ribbon (and I’m not saying that I will, remember), I’d have to be very careful since correctly mixing WinForms and WPF can be a bit delicate. Stay tuned of course. If that’s your decision, stick to it! While users should be encouraged to ask for features, it’s not up to them to tell you how to implement things. :LOL: A very suggestive comment. However, I think its safe to assume that you are satisfied with the preemptive answer. I am somewhat neutral about this decision. I’m really curious to see what you’re doing as far as architecture if you’re using WinForms. With all of the MVVM-ness that seems to be floating around Microsoft at the moment are you considering something like that? On a side note, I’ve been away from the forums for a while. Do you have a section where you talk more “technical” about how it works? I really can’t stand those ribbons that are showing up everywhere on Windows apps lately. I find them confusing and unnatural. And the main reason I don’t like them is because they are only present on some applications, but not in others. The most clear example is the Office 2007 suite, where some programs have the ribbon interface, while others still use the traditional button toolbars. And that conveys the GUI a lot of inconsistency. I prefer to stick to something more universal like the toolbars we have been using for over a decade already, especially because the ribbon-ed GUI can only be advantageously used in a few applications, while most simple can’t put it to good use. So, well, I hope it will dissappear soon, like Google Wave!!! xD xD They are just stupid clever ideas. Yes, I know (I gave it a try with using the beta… then came back to using only OO.o). Because of that I mentioned specifically the “2007” version. I like the Zune software the way it is, with the pre-metro UI. I vote for ribbon in Paint.NET 🙂 Just I’m affraid of performace of WPF because my experience with WPF in complex systems is not very good. But I really would like to see ribbon in Paint.NET. My two cents (or pennies, as we say in England) – no to the ribbon! Too much simplification is a bad thing, IMHO. I much prefer standard menus. I prefer to NOT use any ribbons. I have a wide screen laptop, and the ribbon takes up a large chunk of vertical space on the screen. Before you know it, half the screen is lost to all these “helpers”. If the ribbon went down the side instead of across the top, then I might reconsider adding ribbons to my programs. Umm, ok. Although I’m not sure how this post turned into a “please tell me your opinion on the Ribbon” thread. As a developer, I am quite excited with the WPF ribbon component. That said, I do not think that a ribbon is very appropriate for Paint.Net. Rather, I am more concerned that Paint.Net is still using WinForms without any plans to move on. As a wrapper over the Win32 API, functionality, design, and maintainability are poor. WPF brings so many immediate enhancements. I too did a lot of WinForms initially when there was nothing else, but I have long moved on to better. I use Paint.Net almost daily, but the WinForms GUI always annoys me to no end. Hopefully more thought will be given to evolving out of WinForms in the future. Maybe 5.0. “As a wrapper over the Win32 API, functionality, design, and maintainability are poor.” … This has not been my experience. There just isn’t sufficient reason to rewrite everything in the latest UI toolkit. WPF is not a feature, and nothing has necessitated migrating to it. I really don’t see how it could be so “annoying.” The lower-quality portions of Paint.NET’s UI are a result of older code that hasn’t been upgraded, and not anything that WPF would come and magically save. It’s old design, not technology, in other words. You don’t need toi use the ribbon, Paint.net is just fine the way the gui is right now, if you make changes be sure to announce ’em. No beta version of what? He seems to be a bit impatient about Paint.Net 4.0. Sure. I already said that’s coming next year. So, if I’m understanding it right, does this mean that Microsoft is simply releasing a way to make UI with Ribbon interface? I have to say that comparing Office 2010 to Office 07, the Ribbon interface is vastly improved, and I had a lot of ease in finding what I needed to look for. I just like the classic menu layout over the ribbon interface. With this Microsoft has released an official Ribbon control for use with WPF. There was already one that the OS shipped with (via COM), and one for MFC, but both of those were targeted at C/C++ development. Given you upgrade to VS2010, the MFC Ribbon supports both Office 2007 and Win7/Office 2010 look n’feel (the style can even be changed at run time). I can’t express in words how disappointed I am to hear there won’t be any ribbon for Paint.Net 4.0. Honestly, the Ribbon is so much better than menus and toolbars, I think using it would’ve been a no-brainer. Anyway, the decision is yours. Hopefully, Microsoft will improve Windows Live Photo Gallery in the future so that we can finally have a great ribbon-based photo editor. Windows Live Photo Gallery is a great piece of softtware, but I really don’t see it as a competitor for Paint.NET now nor in the future. The very name “Photo Gallery” says it all: it’s main focus is not image editing/retouching, but managing a photo library. It surves that purpose wonderfully and I use it all the time (it’s one of the best tools I’ve seen from Microsoft), but I really think you shouldn’t compare it directly with PDN. And the fact that they are so different in nature also explains why different GUIs may be uitable for one application and not the other.